The HVAC control unit has a self-diagnostic function for the heating, ventilation, and air conditioning system. To run the self-diagnostic function, do the following: 1. Turn the ignition switch to LOCK (0), and then to ON (li). 2. Set the FAN CONTROL dial to OFF, the TEMPERATURE CONTROL dial on Max Cool, and select the VENT mode. 3. Turn the ignition switch to LOCK (0), and then to ON (II). 4. 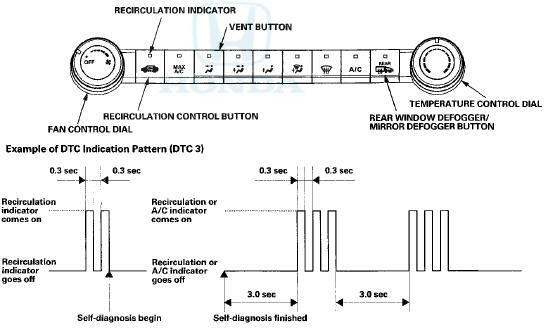 Press and hold the RECIRCULATION CONTROL button, then within 10 seconds press and release the REAR WINDOW DEFOGGER/MIRROR DEFOGGER button five times. Release the RECIRCULATION CONTROL button; the recirculation indicator blinks two times, then the self-diagnostic begins. NOTE: РІР‚Сћ The blower motor will run at various speeds when in the self-diagnostic mode. 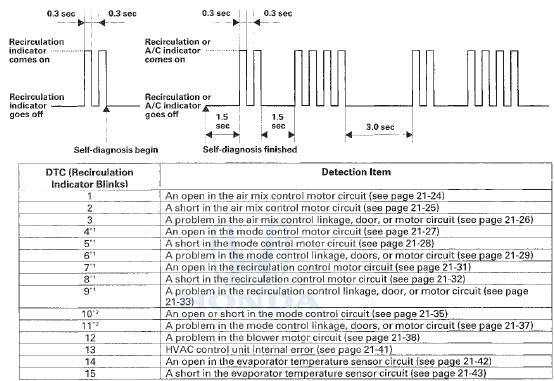 РІР‚Сћ Once the self-diagnostic function is finished, the recirculation indicator blinks, and the number of blinks indicates the Diagnostic Trouble Code (DTC) number. If there are multiple DTCs, the indicator blinks each DTC in sequence from the lowest DTC number to the highest. РІР‚Сћ The indicator pauses 3 seconds, then repeats the DTC blink sequence. РІР‚Сћ If no DTCs are found, the indicator does not blink. When the problem is repaired, DTCs will automatically clear. When the mode control button is in the MAX A/C position, the HVAC control unit will automatically select the recirculation mode and turn the A/C on. If the recirculation switch is pressed when in MAX A/C mode, MAX A/C turns off. If the A/C switch is pressed when in MAX A/C mode, the A/C turns off.